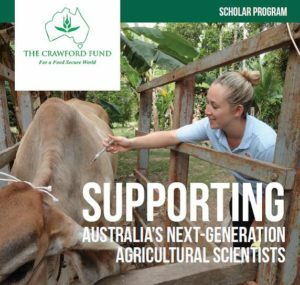 The Crawford Fund has supported young agricultural scientists with an interest in international research and development through its conference scholarship program since 2010. In addition, some of the Crawford Fund State Committees offer international training and scholar awards. While the Fund has been a strong supporter of the RAID network since its establishment in 2013, a new partnership will enable Researchers in Agriculture for International Development (RAID) and the Crawford Fund to work even more closely together, to engage and support early to mid-career researchers with an interest in agriculture and international development. Under the new arrangement, which was highlighted by the Fund’s chair at the 2016 annual conference, RAID will function as an independent Committee of the Crawford Fund. RAID president, Jack Koci, is very excited by the new partnership. “The Crawford Fund has been working to raise awareness about the benefits of agricultural research for international development for many years now, and have actively supported the engagement of many young Australians in this space. They have been strong supporters of the RAID network, so it’s great that we now have the opportunity to work even more closely together to achieve our common objectives,” Jack explained. Crawford Fund Chief Executive Dr Denis Blight is delighted to welcome RAID to the Crawford Fund network and to give it a platform for its important work. “RAID and the Fund share an ambition to increase the engagement of young Australians in international agricultural research through rewarding careers that contribute to economic development in developing countries and in Australia. I am sure, therefore, that this new partnership will be of mutual benefit to RAID and to the Fund,” said Denis. The Crawford Fund’s Director of Public Affairs and Communication, Cathy Reade is also looking forward to the involvement of young agricultural researchers in this year’s annual conference ‘Waste Not, Want Not: The Circular Economy to Food Security’ on 29-30 August in Canberra. “The topic of food loss and waste is really resonating with young people. We plan to again profile RAID to this year’s group of Conference Scholars and have a number of RAID members as mentors to the other young Australians passionate about agriculture for development who are attending. We hope to swell RAID’s ranks with our new scholars and other young researchers attending the conference this year,” said Cathy.